There are many Halong Bay tours but the Halong tour that is best for you is the one that fits your budget and your time-frame. There are Single Day Halong Bay Cruises, Overnight Halong tours and even 3 day Halong Cruises to choose from. The 3 Day Halong Bay Tour should be called a 'Halong Cruise Tour' or as the Vietnamese will ask, 'You Go Sailing Junk Cruise Halong Bay?'. Get the full information about this Full Day (11 Hour) Private Deluxe Tour of Halong Bay. Visit them because you will not beleive that this Halong Bay cruise starts at $62.50USD. How Did Your Halong Tour Go? They picked us up for our 11 hour Halong Tour at about 8am. We just stood in front of our Budget Guesthouse (Same rules if you are staying in a Mid-range hotel) and they arrived on time. It is very important that they have your address or the name of the Hanoi Hotel you are staying at. Make sure that this is done before the departure date of your Halong Bay Tour. The drive to Halong Bay is the ugliest part. It can take between 2.5 and 3 hours. Once at Halong Bay, you will board your Vietnamese Junk Ship. That is when we started to get excited because the boat was something special. Then we sailed off for a cruise in one of the most stunning areas in the world. We anchored in a quiet area, went for a swim and then visited one of the many limestone caves in the area. We were very tired and hungry after that. The seafood lunch went down fast and was a good bit of protein. The lunch was nothing to complain about or write home about. It seemed oddly out of place with our food set out on multi-colored cheap plastic plates set on a beautiful wooden table on the deck of our luxury junk boat. Tour companies want tourists to think that each tour is different and each operator has his own boat. The fact is that there are only a few boats and most everyone is selling a tour on the same boat. 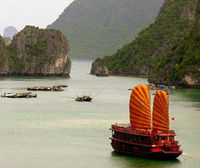 There is just a single itinerary for every boat and every travel company touring Halong Bay. They all do the same things and go to the same places. The only difference is the quality of the boat you'll be on and the subsequent price that the travel agent was able to squeeze from you. The cheapest Halong Tour is on the modern, mid-sized ferries. They almost look good on the walls of the travel agency but you'll get exactly what you paid for. A ferry made of tin cans. The Ferries get to some of the same places of interest but most people complained of being rushed through the tour while the food got even worse reviews. The complaints started to sound like common regret for not taking the trip through Halong Bay on one of the Traditional 16th Century (Replica) wooden Junks (Ships). The Ferries are cheap and you will save a few dollars but I beg you to avoid them. It is like climbing the Eiffel Tower on your knees and without opening your eyes. Tickets are available at any travel agent in Hanoi. Shop around because you can get on some of these ferries for very cheap. There might be a live chicken running around the boat but if you pack your own supplies and sit in the shade it could be decent ride. The Best Boats are the Junks. This is the Single Day Halong Bay Tour that we took. The Junks are the single reason to avoid the ferries. These are the Vietnamese Junks most closely modeled after the traditional 16th century red-sail Junks. Inside the ship, the cabins and the amenities are new and modern. The two most respected and well-known names are the 'Huong Hai' Junk and the 'Bai Tho' Junk. I went with the 'Huong Hai' Junk for no particular reason. There is such little difference between the two and both are known as the best of the top flag replica Junks available to budget tour operators. We found the best prices and the best company to provide our Halong Bay Tours. They offer something for everyone, they are a reputable company located in the US and UK and they offer the most value for the money. We first used Viator Tours for our Halong Tour, then for our Angkor Wat Tours and now everywhere a tour is needed. The experience of our first trip, coupled by the high quality, low prices and reputable nature of Viator Tours was why we adopted them to do all of our tours across Asia and why we endorse them so confidently. It is a big jump from the single day Halong Tour to the overnight Halong tour. You will spend the night on the boat out anchored in the far reaches of Halong Bay. Sleeping inside the cabins was excellent because they are comfortable and the beds are excellent. I hope that you try and sleep on the deck if the weather permits. This tour is a private one so you'll be alone to gaze at the massive sky and the billions of stars. This all makes for excellent honeymoon material. It sounds like I lived in a shell before heading to Halong Bay for a Halong Bay tour. That's because sleeping on the deck of the ship was a spectacular moment that I'll never forget. You'll wake surrounded by the tranquil beauty of Halong Bay. I can't explain on paper what that felt like but I felt like I was in a cradle again and marvelling at everything like a newborn. Doing the overnight Halong cruises gives you an extra day on the water. You'll have more time to go swimming or kayaking (optional) to one of the many limestone caves. Take a lunch break, get back out there and return to the boat for a really nice dinner on the deck of your Junk. There are many more amnemities included in the Overnight Halong Bay Tours but you'll also notice that the price went up. Only on the 3 day Halong Bay Tours do you really get a good look at Halong Bay without feeling rushed. You get every feature of the package, including more time on the kayaks and a chance to get a better look at Cat Ba Island. You can go for a mountain bike ride through the fields on Cat Ba Island or take a hike. The tour includes accommodation right on the water. If a lightning storm brews up during the night then I can guarantee you'll be in for the light show of your life. I once saw a lightning storm barrage Halong Bay with streaks of lightning from a Cabin on the shores of Cat Ba Island. It was an incredible experience. The 1 Day trip was enough for us this time because we had already done the 3 day trip a few years earlier. I would do the 3 day tour again if I went back. The full day tour is tiring but there is so much to see that 3 days makes better sense. 2 full nights to sleep in the nice cabins is a treat. You might have to be a boat person, though. This review of the best-for-the-price halong Bay Tours can't be finished without including some of the most famous tours (Usually the most expensive). It would be negligent not to include THE tour that charges itself as the best. Their Slogan is all you need to read. "For the Ultimate Halong Bay experience let Emeraude Classic Cruises transport you back to the days of old 'Indochina' as you discover Halong Bay in style on board a luxurious replica steamer. Sounds pretty good. I couldn't afford this ship because it was near the price of one of our plane tickets (For 2 people). They also refused to let me on board to have a look around. Even my barrage of questions seemed to pee them off! Snobs. I dug up as many reviews as I could find on the Emeraude Classic. I found that many of them were faked and usually were from a Vietnam IP address and had poor grammar. From the real ones it seems that there were more complaints about the Emeraude Classic than compliments. There were a few compliments but complaints were snobby staff, poor food and expensive on-board amnemities. Whatever you choose. I hope you choose the best of the Halong Bay Tours.